Colourful Ted Baker Print Skater Dress Size 1 UK 8. Bright, whimsical hummingbird print, this statement dress really stands out in a crowd. The waist is accentuated with a ruched belt and the skirt has a net underlay as well as the lining which gives it some volume. I’ve felt really special every time I’ve worn it (a wedding and a few birthday parties) and I’m really sad it doesn’t quite fit now! Hope someone will enjoy it as much as I have. Good condition and dry cleaned after last use. Dispatched with Royal Mail 2nd Class. 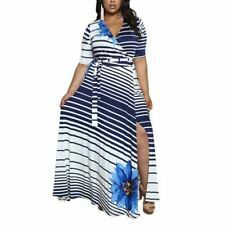 Love Dress size S/M Floral Print Elastic Waist V Neck Wrap Special Ocassion. Condition is Used. Dispatched with Royal Mail 2nd Class. Derhy mint green occasion dress size small 8/10. Condition is excellent: worn once and dry cleaned. It has a loose sequin shown in photo-easily fixable. LOVE this dress and had so many complements when I wore it but sadly it doesn't fit anymore. Great for wedding season. CONCEALED BACK ZIP FASTENING. 2ND CLASS SMALL PARCEL. LENGTH FROM SHOULDER 43" APPROX. UNDERARM TO UNDERARM 24" APPROX. FULLY LINED. BY V BY VERY. Designer dress from Danish label Saint Tropez. Condition: Used, in great condition. Floaty grecian style chiffon dress. C olour: light pink/ dusky pink (2nd photo is most accurate reflection of colour). 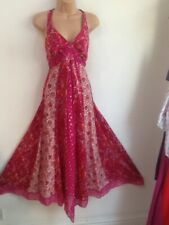 Stunning Myleene Klass dress size 12 - lovely multicoloured Floral print. Grab a bargain. 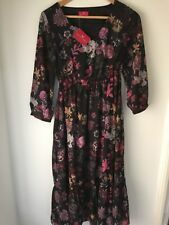 BNWT Beautiful Limited Edition M&S New Bohemian Black Mix Dress in Size 6. The full length from the back of the neck to the hem is approximately 46”. 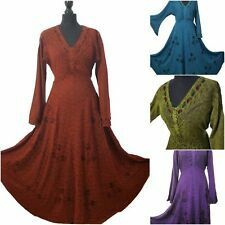 This is a beautiful dress with lots of stylish features I.e. plunging neckline, concealed side zip, pussycat bow, side slits and lovely floaty sleeves. NB THERE ARE BELT LOOPS ON THE SIDE BUT THERE IS NO BELT WITH THIS DRESS. This would look lovely with a tiny brown leather belt or you could easily remove the belt loops all together. Many thanks for looking and please take a peek at my other items. H&M crochet lace dress suitable for any occasion, could be worn for beach wedding. Also a zip to do up at the side. Colour may not be exact as photos as affected by different light conditions. The dress is a label size. Floaty Miss Selfridge dress, cold shoulder, short sleeve with boho bobble edging, fully lined. - Beautiful Monsoon dress with beaded detail and tie waist - Tunic / Smock Style - Black with green, pink and purple print - Lined - 100% silk - v-neck - Size 12 Pit to Pit Measures 18" Length Measures 40" Monsoon Floral Beaded Silk Kimono Style Tunic Dress size 12 BNWT . Condition is New with tags. Dispatched with Royal Mail 2nd Class. Pet & Smoke free. Open to offers Please kindly have a look at my other items thank you. Very pretty little dress (size 10) from Miss Selfridge. The fabric is a delicate floaty 100% silk in a beautiful pale shade of gray/green. The dress is embellished with lace. Plunge neckline. Cap sleeves. Jersey bodycon top with waterfall silk over frills. PHASE EIGHT. (see photo of Phase Eight size conversion guide). plum purple special occasion dress. there are silk frills over a second skirt but. PHOTOS:- I take photographs where possible in natural light, but monitors can differ considerably and colours may not always be 100% accurate. IN A LOVELY BLACK AND WHITE CHIFFON FABRIC. NEW LOOK SIZE 14 LADIES SHORT DRESS. SEE PICTURES AS REALLY FANTASTIC DRESS. TIERED LAYERS OF FABRIC TO FORM THE SKIRT. IT HAS A V-NECKLINE AND GATHERING TO TOP HALF AT. Beautiful dress. Note there is a button missing at the back on the top fastening - see last photo. This dress fits great on, has a V neckline and a back that corset ties. It has two ruffles in contrasting floral and has a split up the leg of the skirt. It fastens with a concealed zipper at the back. - Stunning dress from V by Very - Worn and washed only once - Perfect condition - Grab a bargain - I bought this for £60! - I got so many compliments when I wore this to my brothers wedding! - This dress is longer at the back and shorter (midi length) at the front as shown - Features a beautiful crisscross tie back and ruffle detailing - Perfect dress for a prom or wedding guest! - Fully lined, as shown - Selling a lot of new and nearly new men’s/women’s clothes, check out my other items! - UK only!